During the ski season, we provide breakfast each morning, afternoon tea and cakes and an evening meal. Every morning bar one, there is a cooked breakfast option – as well as a choice of freshly baked pastries, cereals, fresh fruit, yoghurts and porridge. Rest assured you won’t head to the slopes feeling hungry! Each evening on your return we offer freshly baked cakes and cookies with hot drinks. Or, if you are feeling adventurous; hot wings and a bucket of ice cold beers. 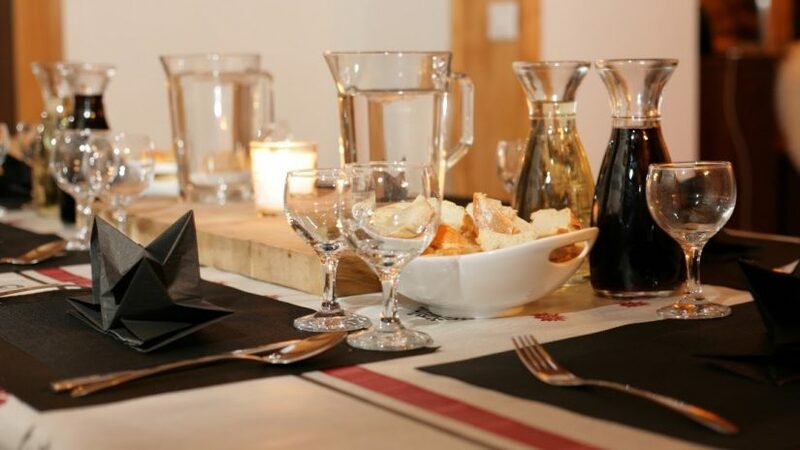 Each night a freshly prepared four course meal awaits – with free flowing wine and beer throughout. If you have a special diet we will be happy to discuss it and will do all we can to accommodate you, so please make us aware when you book.